The Yellow Delicious Apple Tree belongs to the Malus 'Golden Delicious’ family. It is also commonly known as the Golden Delicious Apple tree. Just from the name you get a clue about this species of apple tree. 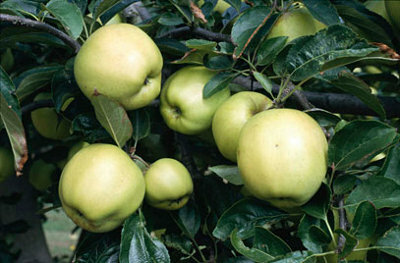 The Yellow Delicious Apple Tree is definitely one of the popular and easy to grow apple tree. The Yellow Delicious Apple Tree grows to mature at a height of about 10’ – 25’ feet, and will spread to about 10’ – 25’ feed. It is said to grow at a very fast growth rate. At spring the Yellow Delicious Apple Tree will burst into bloom and will have clusters of beautiful pink buds that open to eventually reveal the snowy white flowers. The Yellow Delicious Apple Tree eventually bears fruits with oval, horizontal or spreading, erect or upright shape. The apples are extra juicy, crispy and very sweet. It hasn’t any bitterness or tartness in it. The large fruit, golden in color ripens late and has a fine yet sweet flavor making it preferable for either cooking, baking sauces or also eating as fresh fruit. This apple tree species exists in two different categories; the semi-dwarf type that mature at a height of 15 – 20’ or the standard type that matures at a height more than 25’. The Yellow Delicious Apple Tree grows quite well in a well drained soil and should be exposed to the full sun. As all plants they need water, for newly planted trees one can water through drip-lines once or twice weekly to establish a system of healthy roots and branches. But you will irrigate more frequently during the drought seasons. Though they are self fruiting tree species, planting with pollinators will ensure more fruits. They can be planted with Red delicious, Red Jonathan, and Honeycrisp. Rodents and rabbits can destroy your Yellow Delicious Apple Tree, proper care should be provided. It is always a good choice to have a few trees of this species even just for home produce. There is always a difference in taste of fruits bought from the market and the once that are left to ripe on the apple tree.